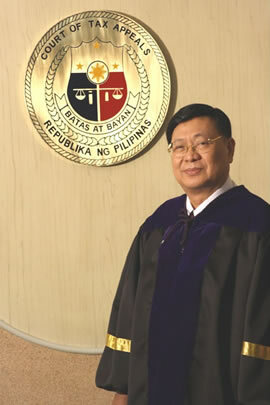 Before his appointment to the Court of Tax Appeals on January 2, 2003, Associate Justice Lovell R. Bautista was a Senior Partner from 1993 to 2002 at the Balmeo, Bautista and Peñasales Law Office, which specializes in tax advisory and advocacy. A CPA-Lawyer, he was also a Managing Partner at the accounting firm Bautista, De Vera & Co. and a Tax Partner at the auditing firm KPMG Fernandez, Santos and Lopez from 1991 to 1992. A native of Cagayan de Oro, he finished his Bachelor of Science in Accountancy at the Liceo de Cagayan University and his Bachelor of Laws at the Ateneo School of Law. In 1984, he finished his Masters in Law at the University of Pennsylvania. Thereafter, he took and passed the New York Bar on December 10, 1985. He is a member of the American Bar Association. On May 12, 1986, he was admitted to practice before the US Tax Court. He has been recognized by the Ateneo Law School as a distinguished alumnus for his inspiring dedication and outstanding achievements in the government service and in the affairs of the Ateneo Law Alumni Foundation Inc. where he served as President in 2006 and 2007. He has also been honored by the Liceo de Cagayan University as an Outstanding Alumnus for his exemplary accomplishments, dedication and leadership in the field of the Judiciary. He was a Professor at the San Sebastian College of Law from 1988 to 2002. In addition to being Chairperson of the Third Division, he also chairs the Personnel Selection Board (1st & 2nd Level), Bids and Awards Committee-2, and the PRAISE Committee. Justice Bautista is married to Angeles Carbonell of Mangaldan, Pangasinan. They are the proud parents of Filbert Lovell, Angelo Lovell, Agridan Lovell, Deodar Lovell and Angelique Lovelle.